Bargoed is the topmost box on the Rhymney valley line. 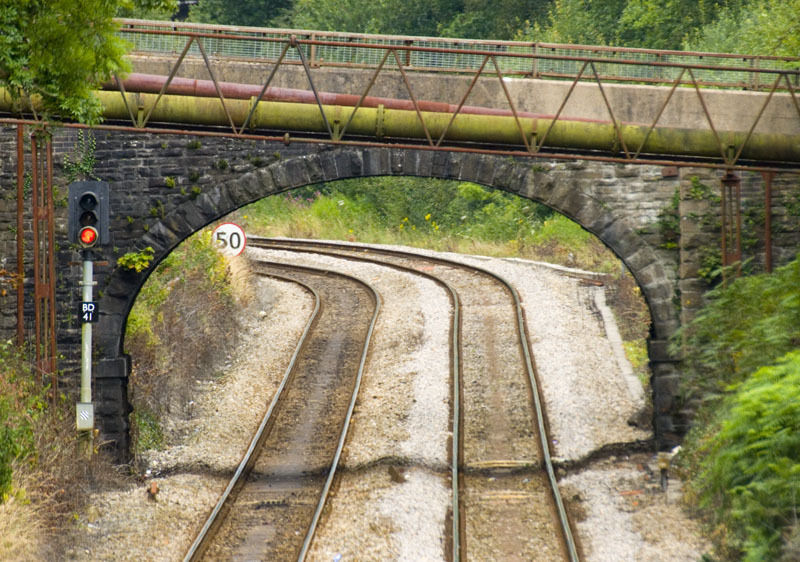 Here the double line singles for the final section to Rhymney - this is the left-hand track round the curve. To its right is a reversing siding, now largely disused. 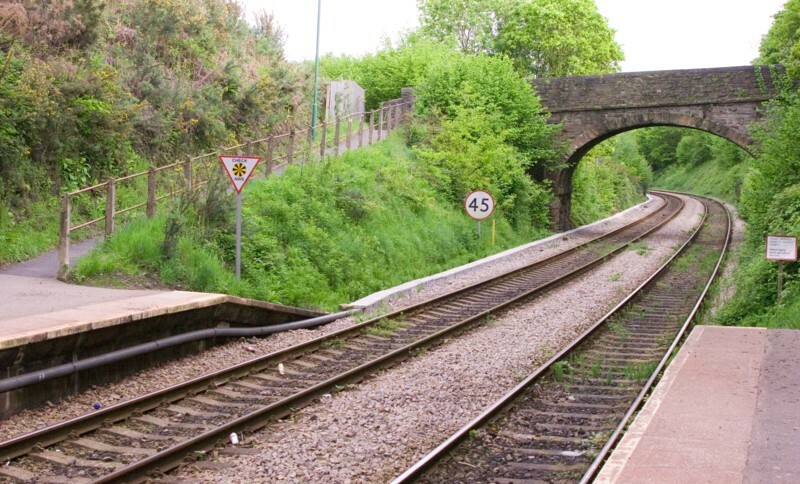 On the left is a recently-installed run-off siding which now provides the overlap needed to allow an up train to be signalled into the station platform while a down one is signalled off the single line into the opposite platform. 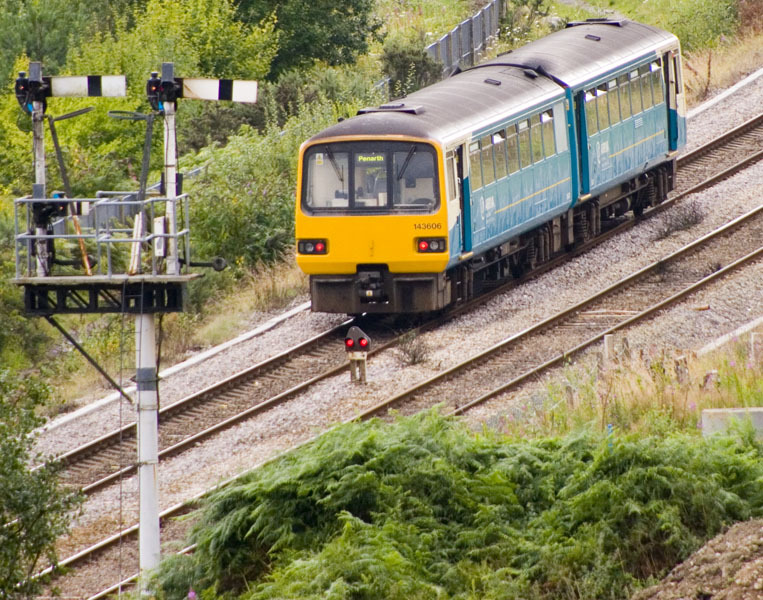 In the opposite direction, the line descends towards Ystrad Mynach. 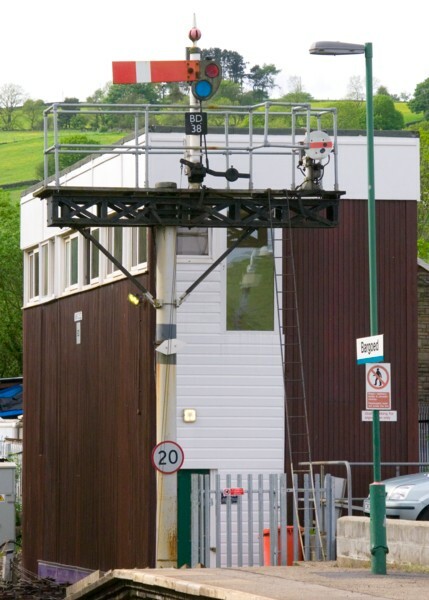 Bargoed signalbox. 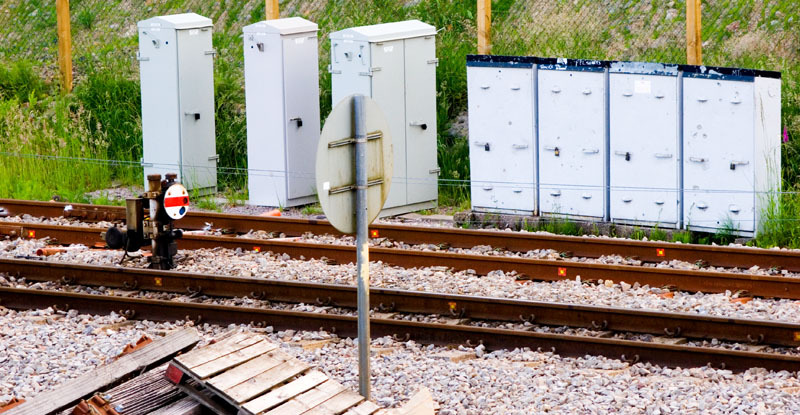 This box was originally installed at Cymmer Afan, between Tondu and Treherbert, to replace two boxes which had previously controlled the separate GWR and RSBR stations there. After the line there closed, the box was re-erected here on 9 November 1970. The up main innerhome (BD36). 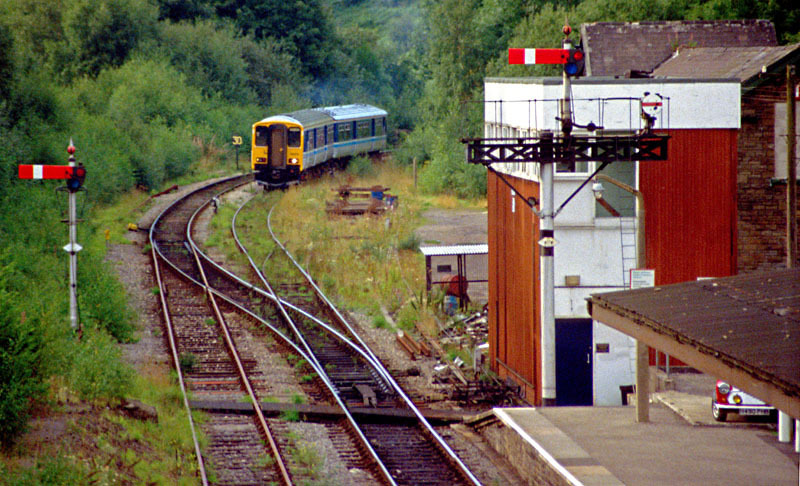 The down platform is signalled bi-directionally; this signal (BD38) controls departures to Rhymney from this side. The disc reads to the reversing siding. A closer view of the down starter (BD3). 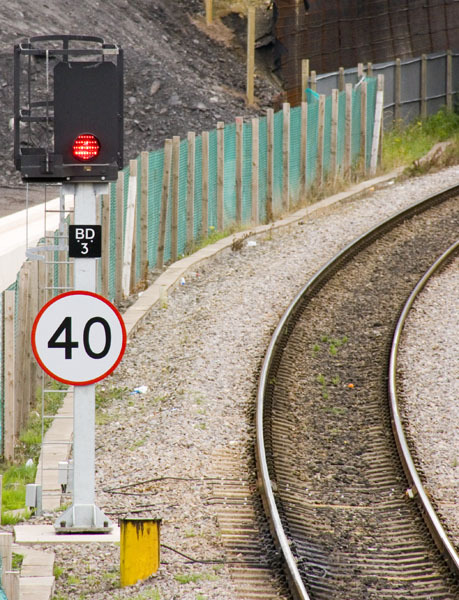 This has since been replaced with a LED signal - see below. The up intermediate homes are quite some way below the station. 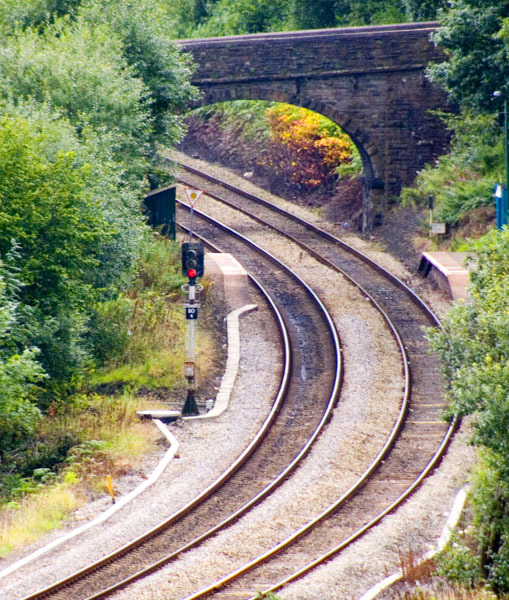 This shot is taken from Gilfach Fargoed - the next station down the valley. 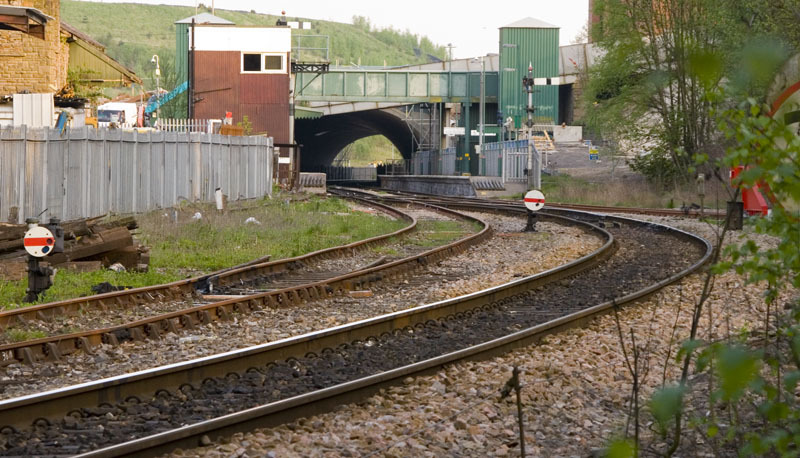 A closer shot of the above signals (BD37/BD40), which allow up trains to enter either platform. 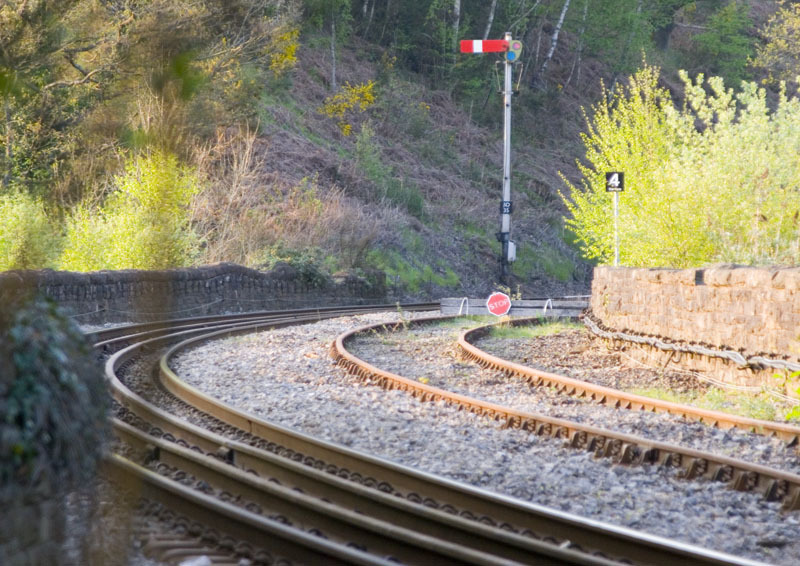 The calling-on arm allows trains to enter the down platform even if it's partially occupied. The colour-light in the foreground is the down advanced starter (BD4). Gilfach Fargoed looking towards Ystrad Mynach. Because the down advanced starter, immediately before the station, also acts as repeater for the next signal, there is a warning sign at the end of the down platform here. A close-up of this sign. AWS - Automatic Warning System - is a drivers' reminder device with a display that registers whether the signal was yellow or green when he approached it. 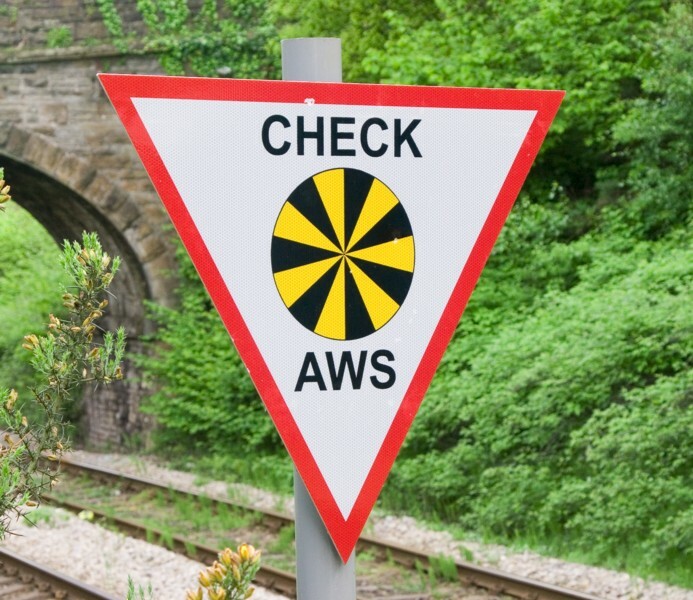 The yellow-and-black "sunflower" pattern is what the AWS unit will display if the signal wasn't green. 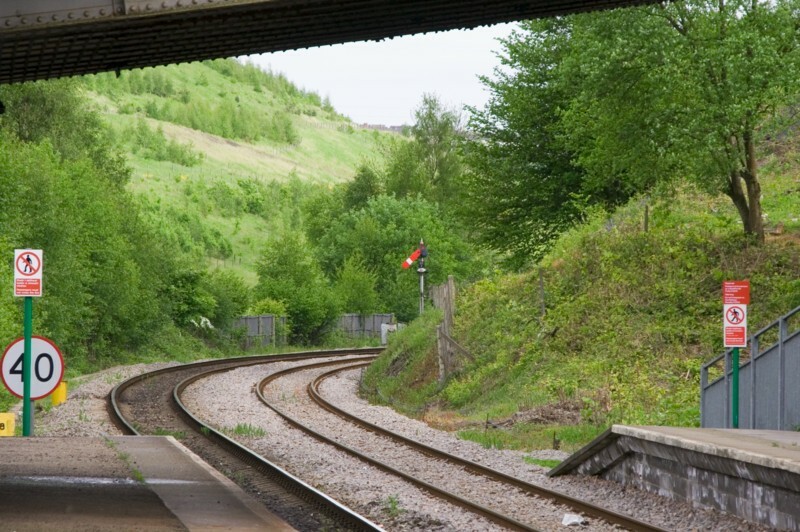 A view of the line south of Bargoed station, to Gilfach Fargoed at the very top right, showing the facing crossover and the position of the up intermediate homes. 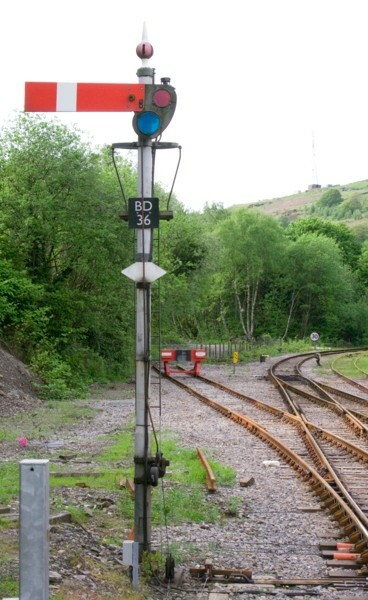 The semaphore down starter shown above has now been replaced by this LED signal, closer to the platform which is also being extended. A lot of development is going on here at the moment - new roads and shopping centres - some of which will be built directly over the line here. 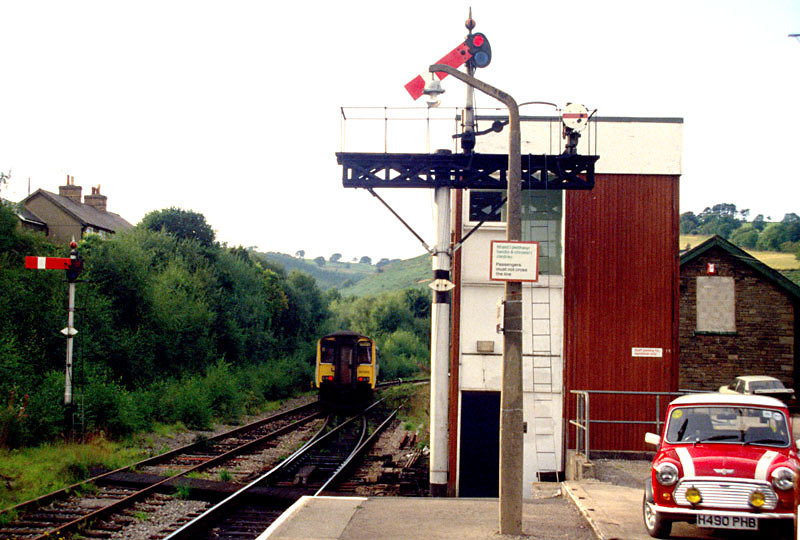 The down advanced starter (BD4), with Gilfach Fargoed station and the AWS reminder sign beyond it. A down train passes the up intermediate homes bracket. Note the up limit-of-shunt marker just in front of the train. Just beyond Pengam station platform is Bargoed's last controlled signal on the down line. 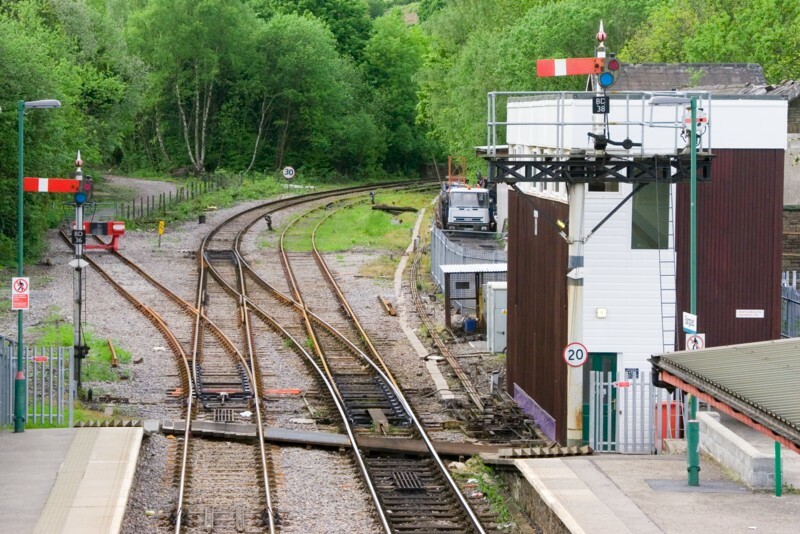 Until the recent resignalling between Bargoed and Ystrad Mynach this would have been classified as an Intermediate Block (IB) signal, but the section between the two boxes is now worked by Track Circuit Block (TCB) and this is designated the outer advanced starter. Looking back up the valley from Pengam is Bargoed's up main home. 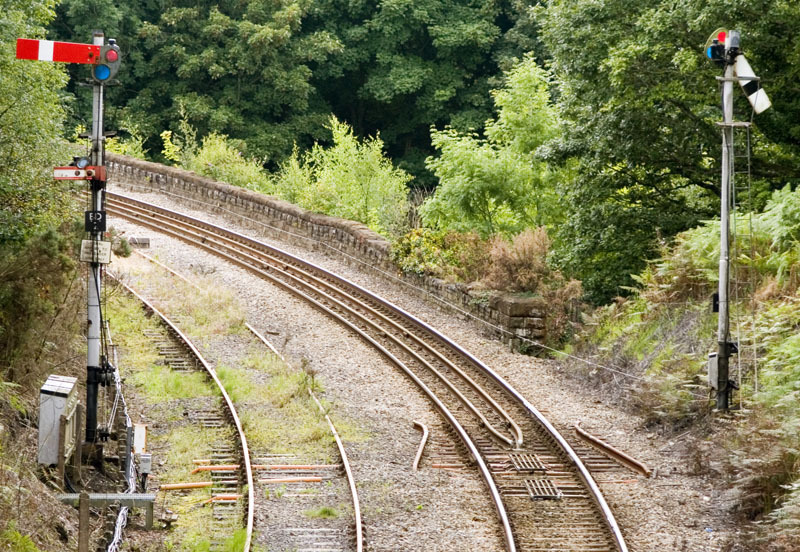 At the very opposite end of the layout, to the north of Bargoed station, are the down home and up starter. 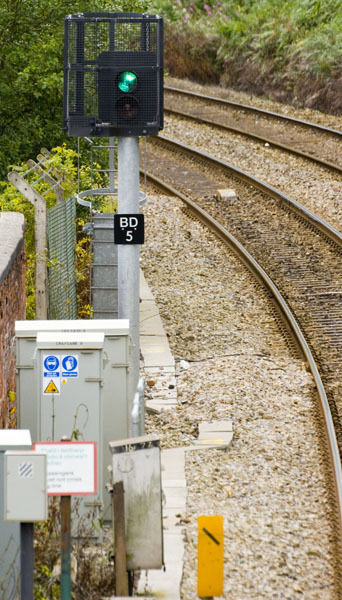 The two grids in the track are Train Protection Warning System (TPWS) Train Stop Systems - a separate one is required for each signal because they are directional in operation. The view from north of the station. Note the GWR-pattern disc for moves off the Rhymney line. 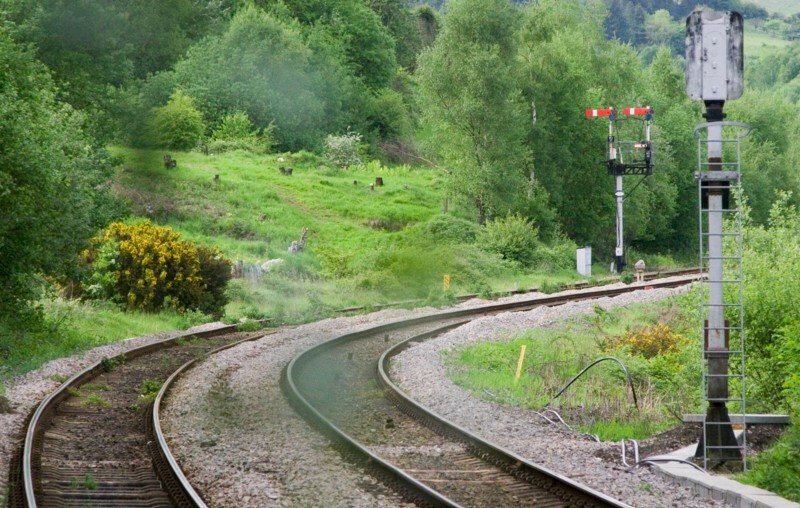 In the background the new Bargoed tunnel can be seen - this is why the original semaphore starter had to be replaced. The up starter, and the stop board at the end of the reversing siding. 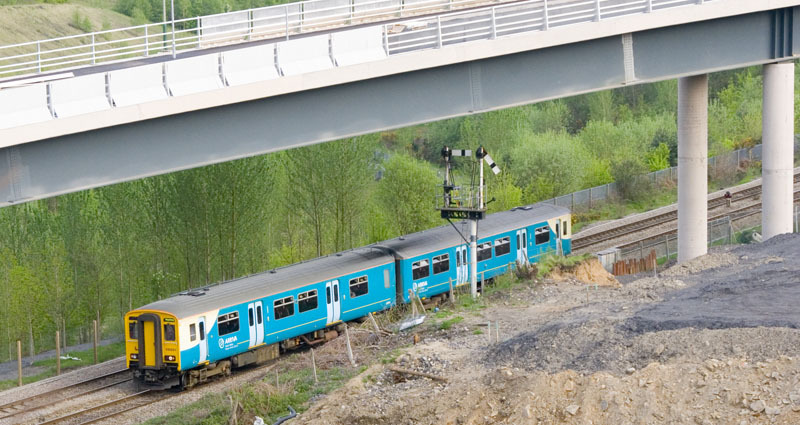 There can't be many semaphores that are directly below road bridges - but the up intermediate homes bracket now is, courtesy of the new Bargoed bypass! 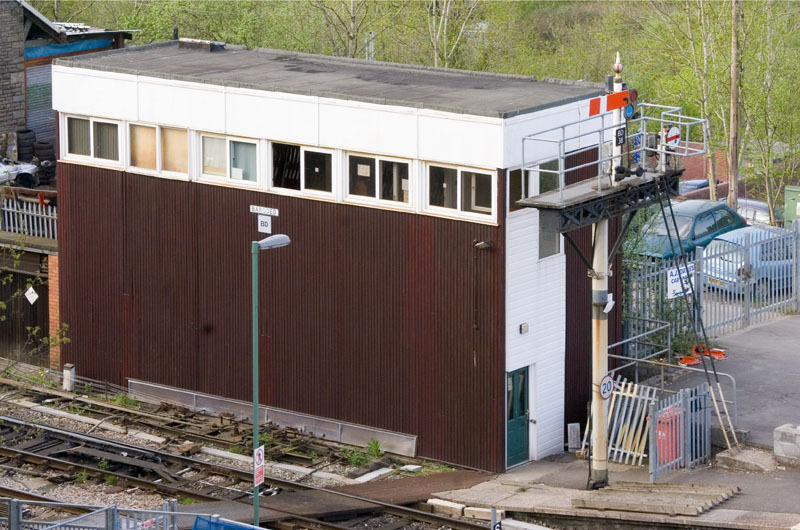 The signalbox, viewed from a terrace above the railway line. 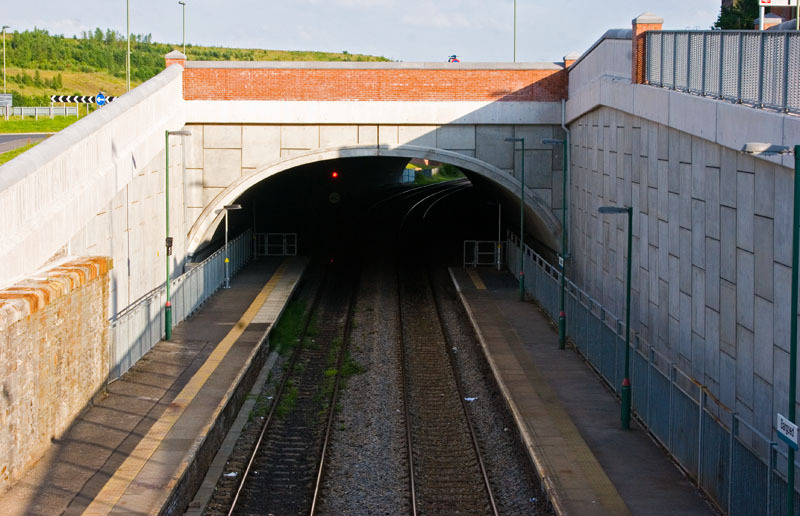 The completed tunnel, with the light of the new down starter visible. Completion of this has also allowed the old, narrow road overbridge across the station to be demolished. 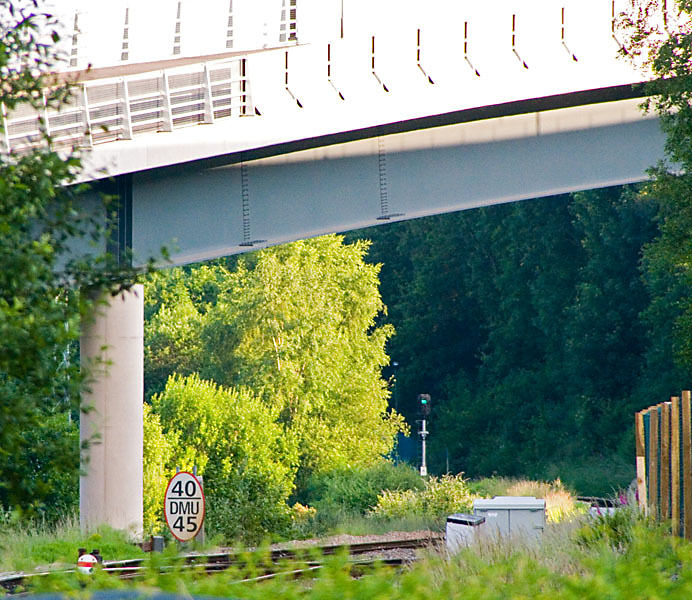 Good views of the line can now be obtained from the new road network. This is the South junction. The South junction again, with the down advanced starter visible beyond. 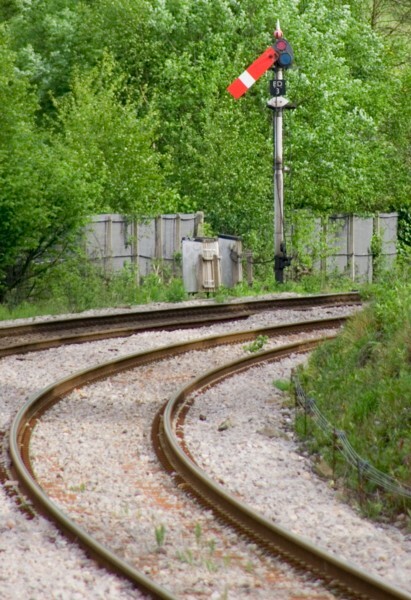 A closer view of the disc for reversing down the up line over the South junction. ...because it was the only platform that existed in 1994. Then, trains terminating here often had to stand in the reversing siding, as here, to allow trains to/from Rhymeny to pass them. 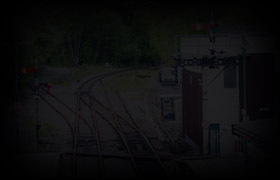 More information about Bargoed signalbox can be found on the Signalling Notices site. 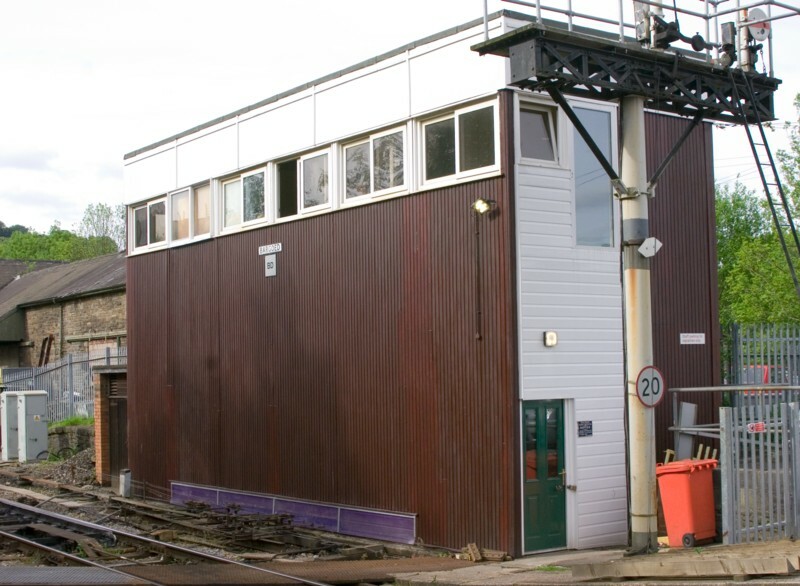 Thanks to Dave Harries and Phil Deaves for the information about the history of the signalbox here.